Your experience with us doesn't end at the purchase of your gown. We continue into the most exciting part of the dress journey by fitting your gown with our In House Alterations. We are proud to offer our brides a package incentive when purchasing your gown with us. 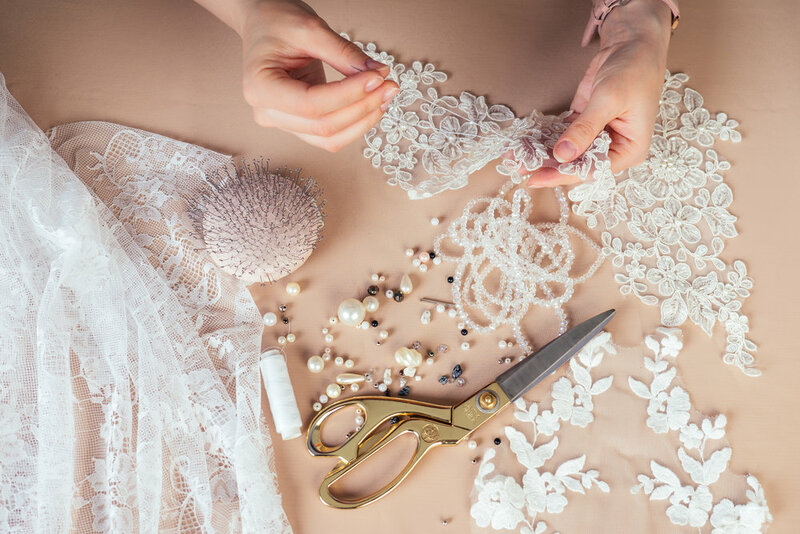 Once your gown arrives and you have completed your Gown Viewing Appointment, your stylist will set your first fitting appointment with our seamstress extraordinaire, Nancy. She will guide you through the process by providing a stress free environment and friendly hand to tailor your gown to fit you the way you envisioned for your big day. The alteration process starts about 8-12 weeks prior to wedding day. If your wedding day is sooner than this allotted time, no worries! We offer rush options for those who need a quicker turnaround time. You are required to bring your undergarments to EVERY fitting as this may change the fit of your gown. We currently do not provide any undergarments such as bras or shape wear. We do offer slips. If your gown has a low back or illusion back, we do offer bra cups to be sewn into your gown for an additional fee. If you are unsure, please check with your stylist for recommendations. The typical fitting appointments needed for bridal gowns are 3 or less. If you are altering a bridesmaid or mother-of dress, 2 fitting appointments are typically needed. Each dress is different and depending on your schedule, you may have 1 more at most. When you ordered your gown, you chose a size that would fit best based on the designers size chart. Now it’s time for our seamstress to work her magic. At the 1st fitting, Nancy will pin your gown while you are in it and talk with you about any concerns you may have about the fit. She will show you what a bustle looks like and answer all of your fit questions. At the end of this appointment, we will set your second fitting based on your wedding date and complexity of the work needed. At your 2nd fitting, you will put your gown on and do a check fit. This appointment is to ensure that all the alterations discussed and pinned at your first fitting are complete and to your liking. Nancy will also show you and a guest of your choosing how to do your bustle as well. So make sure to bring someone with you. If you do not have anyone to be at this appointment with you, no worries, we have you covered. There is always an option to video it! If everything is complete at this fitting, we will get you scheduled for a pick up, typically the week of the wedding. If your wedding is further than 4 weeks out, we may schedule you for a check fit prior to pick up. At your final fitting, we will check over your gown to ensure we have achieved the best possible fit! We want you to be pleased with your fit as this is the most precious garment you will wear in a lifetime. We will schedule you for a pick up after this appointment is complete. It is important to know exactly what shoe you plan to wear with your gown on your wedding day. We do require that you have your shoes with you at EVERY fitting. Once the gown has been hemmed to the shoe that you have selected and change your mind on the heel, there may additional charges to re-hem. Sometimes we know the most important feature of your gown is your bustle! We also know how stressful learning to bustle a gown can be. We suggest bringing someone with you to your final fitting that will be there to assist you with this. If there isn't anyone that can be present, no worries. We will record it for you! Also remember that if you have a wedding coordinator, they usually know how to do it! This is where we will check over your gown to ensure it is perfect! We will press it for you and pack it in a long white garment bag with the train in the back. Some trains will not hang so we just let it flow freely. We will put a bust form in it so that it stays nice and pressed for you! We do offer an alteration package for those who did not purchase their gown with us! Give us a call and one of our stylist will answer all of your questions. Payment in full is required at first fitting to start the alteration process.